When you have certain kinds of colors available to help you perfect a look, some of them are going to be fairly obvious ones to fly towards. If you've got some black, gold, and green, for example, a witch is a great option. Those dark lips, green flesh, and the flecks of gold at the eyes will make you look powerful, noble, and wicked as heck! Same with a goblin or even some alien breeds. But, with a bit of creativity, your gleaming tiger goes the way of the zombie! A reptile gets a touch of Midas! A Glam Rocker goes a little ghoulish! 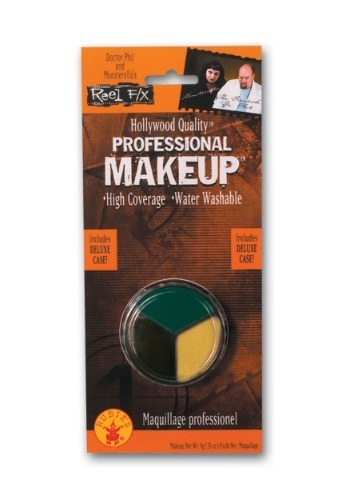 Let your creative powers rise to brand new tiers when you use this Green, Black, and Gold Makeup kit. This professional-level quality paint contains a case to keep the paint from drying out and has application and removal instruction to make sure you can focus entirely on your creative look rather than figuring out the science! When you're crafting your look, the ultimate win is being able to depend on your own creativity to find a way to make the look especially unique. Of course, the added benefit of some of the most iconic colors met with professional quality certainly can't hurt!